What is the coverage for the 2 pound container and how is it dispensed ? 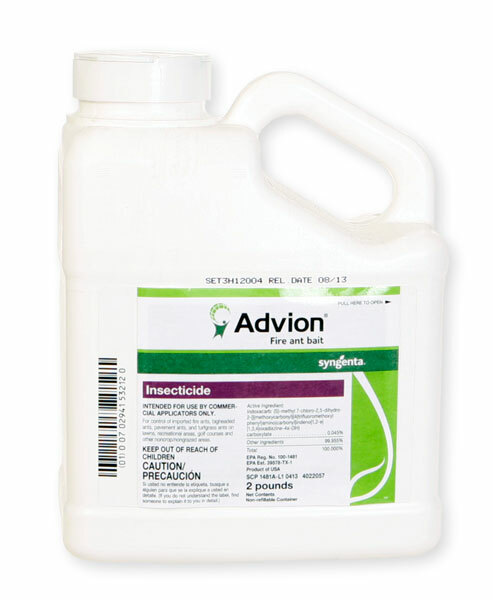 Advion applies at 1 lb per acre. So this bottle would actually cover 2 acres. It's really hard to scatter any bait at 1 lb per acre unless you have special application equipment. Here is what I recommend - use small amounts - 1 tablespoon or less and scatter around the perimeter of fire ant mounds, not on them. Try to adjust the amount you are applying so that 1 lb can be applied over an acre. If this is for a home, then the average yard is 1/4 acre, and you will only use 1/4 lb. Apply the bait early in the morning when there is no dew or wetness and the ground is dry. The Fire Ants need to pick up this bait within a few hours. If it rains, then that is not good. Remember, this is a bait, not a granule insecticide. It will only last a few hours or day until it goes rancid, just like food will. The Ants will not eat rancid bait.